I paced the room with a fussy baby in my arms and a defiant toddler upstairs in his room. My afternoon, which followed a morning filled with temper tantrums, spit up, doggie accidents, piles of laundry, and a host of other troubles, seemed never-ending. I felt like a complete mess and had not even eaten lunch. My entire day had failed to go according to plan. I felt frazzled, worn out, irritated, and ready for my husband to get off work. In fact, I felt downright sorry for myself, and couldn't decide if I was planning to go on a tirade or a cry-fest when he stepped through that front door. Misery loves company and I was more than ready to share the load. I imagined Troy coming through the front door of our home, setting down all his things, and taking all the fussing children from me, while I complained and carried on about the challenges of my day and the frustration of my day's work. How often am I forgetful that he, too, has pressures and frustrations from a day's work? That he, too, bears burdens that are exhausting, and strives to accomplish tasks that are beyond his means and ability at times. How often I forget that he longs to come home and experience welcome, not war. Do I make him glad to come home? Of course he is happy to see his wife and children, but is home a place of gladness (despite the struggles and challenges)...is it a place of rest? ...Not to punish him for getting to be away all day, but celebrating his getting to come home. Sadly, my flesh operates on doing everything out of pride and selfishness. I have no problem remembering to consider my needs above all else. How merciful, then, is Christ, to redeem us from what comes naturally, and to give us the newness of life that makes it possible for us to create a happy home, a restful re-entry, and a glad welcome for our families. And, when we do so, we might find that a helping hand, a shoulder to cry on, and a gentle word of comfort not too far behind the setting down of bags and kicking off of workday shoes. Blessing is so inspired by blessing. Generosity begets generosity. 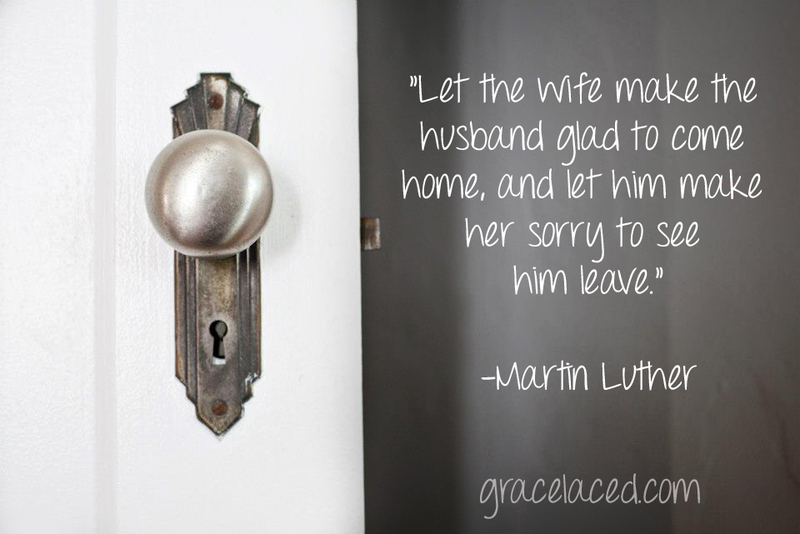 And, as we consider one another more important than ourselves...a wife that welcomes finds herself opening the door to a husband that is willing. A willing husband find himself coming home to welcome.